Card of the Day ~Mother~ The answer to your question involves the topic of “mother”. Mother Mary is with you, helping you with any emotional upsets with your own mother, such as grief, anger, or worry. She can aid your healing from long-standing patterns between the two of you. As you do so, you’ll also be made well in other life areas. For instance, healing mother issues improves your relationships with other women, especially powerful ones and those in authority. It helps you be more open to receiving, since feminine energy is receptive. If you’re a woman, reconciling any mother issues can improve your self-love and self-esteem. This is also a message about you as a mother or caregiver. Mother Mary wants to help you in this life area. She’ll alleviate any guilt or stress that may be interfering with the joy of parenting. 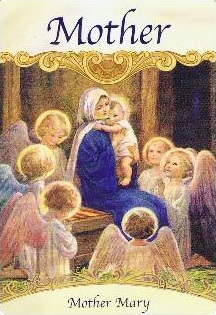 If you’d like to help children in general, ask Mother Mary for a Divine assignment. She has so much love for children that she gladly helps their caretakers so that they’re better equipped to help little ones in many ways. May you have a beautiful day filled with blessings. I love you all!